Ralph Smart described the experience of making Bitter Springs as “the worst time I ever had in my life”. To his credit, the behind-the-scenes tumult that marked the movie is not especially apparent on screen. Veteran George Heath’s glorious black-and-white cinematography, the metronome pulse of the Vaughan Williams score, even something about Michael Pate’s calm gravitas keep this movie on an even keel. Perhaps the only false note, and it’s not an insubstantial one, is in the film’s final moments. Various conclusions were proposed, Smart preferring a terrible scene of slaughter – the bleakest of endings intended to reflect the bleakest of circumstances. The final choice, a startling fade from irreconcilable racial conflict to happy pastoral productivity is nothing more than a disheartening gesture designed to salve the film’s political sponsors. It’s not well-known that Bitter Springs is a very early example of state government competition for film production in Australia, in this case its South Australia location selected at the last minute after the producers rejected a Queensland government offer. 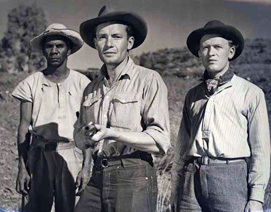 The film was vigorously sponsored by several South Australian government departments in part to promote the tourist potential of the Flinders Ranges and the agricultural industry of the region but, most importantly, to draw attention to their new policy of assimilation for Aboriginal people. But the compromise of the film’s ending was not, by any measure, the only issue that upset Smart. He had already swallowed unwelcome interventions from Ealing’s Michael Balcon, in particular the casting of comedian Tommy Trinder in a major role. Smart could not believe a serious drama about inter-racial conflict in colonial Australia should accommodate a vaudeville act and for many contemporary critics this also proved an insurmountable problem. In contrast, positive assessment of the film centred on the performance of the uncredited indigenous actors. This interest also marked the film’s pre-production period in which a series of media scandals about the treatment of these actors erupted. The producers and the government faced hefty media indignation when the Aboriginal actors arrived on location in Quorn and were found to have travelled vast distances across the state in open rail carriages. The media and the parliamentary opposition were quick to point out the apparent disparity between the claims made for Aboriginal culture in Bitter Springs and the actual treatment of the poorly compensated Aboriginal cast members in the course of making the film. To be fair the filmmakers were not responsible for these arrangements which were undertaken by the South Australian “Aborigines Protection Board” as part of the government’s sponsorship package. Still, it can’t have made for easy times on the set. To add insult to injury production was extensively delayed by unseasonable, drought breaking rain in its central location, the South Australian village of Quorn. Chosen for its proximity to the Flinders Ranges and its reputedly dry climate, Quorn has a rich legacy as a location for Australian and international film production and might be claimed as Australia’s answer to Monument Valley, providing the setting for a swag of films including Kangaroo (Lewis Milestone, 1952), Robbery Under Arms (Jack Lee, 1957), The Sundowners (Fred Zinnemann, 1960), Sunday Too Far Away (Ken Hannam, 1975), and Gallipoli (Peter Weir, 1981). One high profile supporter of the movie, the unlikely film critic, Prime Minster Robert Menzies, stated that he “thoroughly enjoyed the film” and thought the work of the Aboriginal actors excellent. “We are inclined to condemn our own products”, Menzies added, “I think we can praise this one.” Curiously Menzies then goes onto invoke the cultural cringe he has just dismissed by noting that he believed the film would be popular overseas and that the story had given plenty of opportunities to Tommy Trinder, “who was well supported by Australian artists” (1). There are indeed many reasons to praise Bitter Springs although Trinder is not necessarily one of them. The sectional plot takes on the expansive tone of its outback setting in the style of a stepped narrative progression that is tied to a series of spatial shifts. Moving from the urban fringes through the desert to a kind of Shangri-la for sheep, a family of white settlers and their British and Aboriginal hired help must make a move to “the centre”. The head of the King family is Chips Rafferty, playing against type as an unapologetic racist colonialist. Wally King is challenged by those he meets and his newfound circumstances to find the middle-ground, as both a moral, political and geo-spatial place. Bitter Springs presents his personal journey as an echo of the physical one already made. This journey to the middle inflects aspects of many of the film’s characters, in particular Emma (Nonnie Piper) who prefers to dress like a boy but learns the value of normative dress codes, and Blackjack (Henry Murdoch) who plays a “pan-Aboriginal” character initially inclined to sympathising with the plight of the dispossessed local inhabitants, a fictional Aboriginal community called “The Karagarni”. Wally: If only they’d help me grow wool. Get new water dug. Could I ever make them understand? Ransome: Maybe the point is – you understand. That’s the big thing – it’s a start. Bitter Springs then concludes abruptly, with its fleeting fade to the image of a Karagarni elder helping Wally shear a sheep – a representation of an enforced compromise that sits somewhat ironically against Smart’s unhappiness at his own behind-the-scenes “compromises”. Like the almost simultaneously released Hollywood movies, Broken Arrow (Delmer Daves, 1950) and Devil’s Doorway (Anthony Mann, 1950), Bitter Springs produces sympathy for the plight of an indigenous community bringing into sharp relief the intolerances of white colonialists. But Bitter Springs doesn’t personalise the Karagarni. Rather the film pits a sort of socio-arithmetic problem; what happens when there are too many people for one waterhole? Given the current natural resource issues confronting Australia it may well be that the film’s environmental message will prove to be more prescient than its compromised racial politics. The Adelaide Advertiser 26 June 1950, p. 10. Deb Verhoeven is Professor and Chair in Media and Communication at Deakin University (Melbourne). She is a member of the Australasian Association for Digital Humanities (aaDH) and President of the Board of Senses of Cinema Inc. Her most recent publication is Jane Campion (Routledge, 2009).